Tim Berners Lee's idea of a Web that includes documents, or portions of documents, describing explicit relationships between things and containing semantic information intended for automated processing by our machines." The "definitive" introduction was probably Weaving The Web, published in 1999. This is Slippery Slope argumentation, as if the fact that there are imperfections due to human involvement means that it should just all be thrown out. Furthermore, the author only chooses to look at the negative side of the "more-than-one-interpretation-of-data" coin. That's exactly what the semantic web wants to do there, direct people towards the positive side of that coin and flexibly allow but powerfully direct multiple interpretations. However, even in the face of search engine optimization Google somehow manages to provide extremely high quality results based on metadata. In general, I believe that the benefit of common metadata and ontologies far outweighs the cost of the inaccurate or misleading use. Over time, maintainers and users get better at separating the wheat from the chaff. Google assumes the burden of doing so, and has spent enormous amounts of money, brainpower, and computing power to do so. Requiring every individual user to make the same investment is not practical. A Semantic Web that's tied to a specific vendor to be usable isn't that useful. The effort to categorize every Wiki page would seem to fall under the aegis of Semantic Web. I imagine someone out there with lots of time and an attention to detail could potentially generate a Dublin Core based RDF for each and every page on Wiki. Meta Wiki? "Semantic Wiki Wiki Web could be a good idea to work on. Don't you think?" "Use URIs that contain as little information as possible." Perhaps point to Memorable Random Strings (MeRS) and other such resources? "Reuse existing ontologies/namespaces wherever possible, but if your RDF starts looking like Frankenstein's early models then consider defining equivalences/subclasses of classes found in other schema within your own schema." Sean Palmer is turning Semantic Web Tips http://infomesh.net/2001/08/swtips/ infomesh.net into a collaborative thing. Feel free to add your contributions above. ERCIM has a really good special issue on this stuff. 26 short topical papers. Would you like to read Danny Ayers views (touches on Google Search as well) blog at dannyayers.com and tell C2 community about its contents and your views of it? 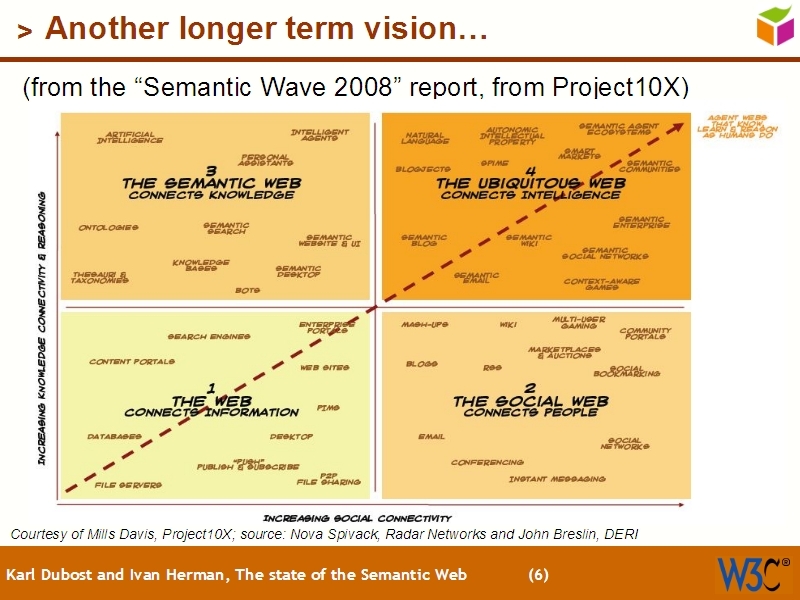 ...describing the benefits of Semantic Web technologies - until there are more RDF-oriented applications and services around, the benefits of of using a domain-agnostic language above that of XML won't be apparent. What benefits? The Semantic Knight vs The Hacker (Monty Python parody): lists.xml.org The other two parodies in that thread are also pretty funny. One possible tool is Cubic Web.